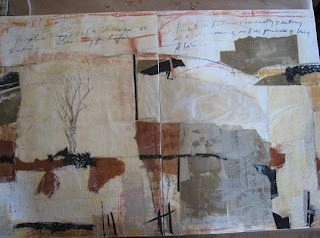 Today I started working more on the new encaustic mixed media diptych. I got out the panels yesterday…both 24 x 18″….so the two will measure 24 x 36 like the last piece I did….only in two parts. I laid out some papers I had after scrounging around in all my papers. Then I decided I didn’t want the color of the wood to interfere in the relationships of the color or non-color. So I got out the encaustic gesso again……Holy Grail and then had to wait for it to dry. Today in the humidity, it took longer than usual. I fished around in all my mark marking crayons and pencils and found some pastels and that sort of thing. I made marks randomly after taking some papers off the panels. I did a little writing that might or might not be there when I get through across the tops of both panels. I don’t like to be able to read the whole thing although I don’t mind a few words here and there. 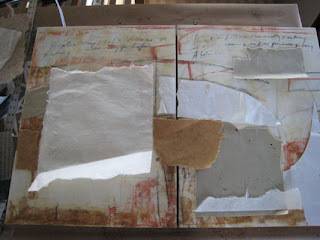 After taking all the papers off I hit the whole surface of both panels with clear encaustic medium and fused them. Then I got the papers back out and laid them down again. they never go back where you started…but that’s okay in this instance. As you note the pieces look light. When you start laying the medium to them they will darken. SO, although I know they will be darker, I just go with it and put them down anyway. I will have to work with the relationships of the values and colors as they develop. I went looking through all my papers again and found a drawing I did a gazillion years ago of an old elm tree. I don’t remember if it is charcoal or graphite but I tried the transfer method and it worked great without having to wet the paper……..I just rubbed the dickens out of the back of the paper and it went into the wax. By the end of the afternoon, I had this to show for all the relationships and fusing………..
SO…I’ll be back tomorrow to work on this some more….